A NOVELTY PAINTING (April 2007) - page one. Timber frame construction by M.J. Doherty, Building and Joinery Contractors. I was commissioned in April 2007, by the new owners of Drumadoon Hall (restaurant and hotel), to design this old fashioned Victorian seaside novelty of a cut- out, where you put your head through a hole and have your photograph taken. 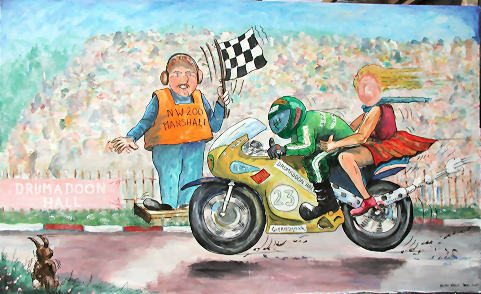 To 'flex my muscles' before attempting the long-term version, I have done this cartoon of the North West 200 Motor Cycle race. 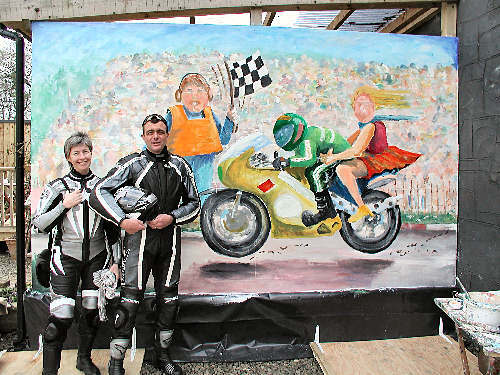 A race held every May which attracts thousands and thousands of motorcyclists - many of whom, hopefully, will be stopping by on the way to the track for coffee and, arguably, the best scones in the County. The painting work is almost completed in the photo below and only the black (cartoon) outlines have to be put in and the two heads cut out with a jigsaw. Figures (Scone customers?) for scale. Mural is 12 ft. wide by seven feet high. And the photo above is the mural with the main elements now outlined in black. Outlines give a painting a Cartoon/Child's book illustration feel. I rarely outline - there are no outlines in real life or nature. All that remains is to cut out the two heads.